Sometimes, all we need for the perfect appetizer or pot-luck contribution is a simple vegetable platter with a jaw-dropping dip to accompany it. If you’re thinking about making something like this for your next gathering, you’ve found the perfect recipe. 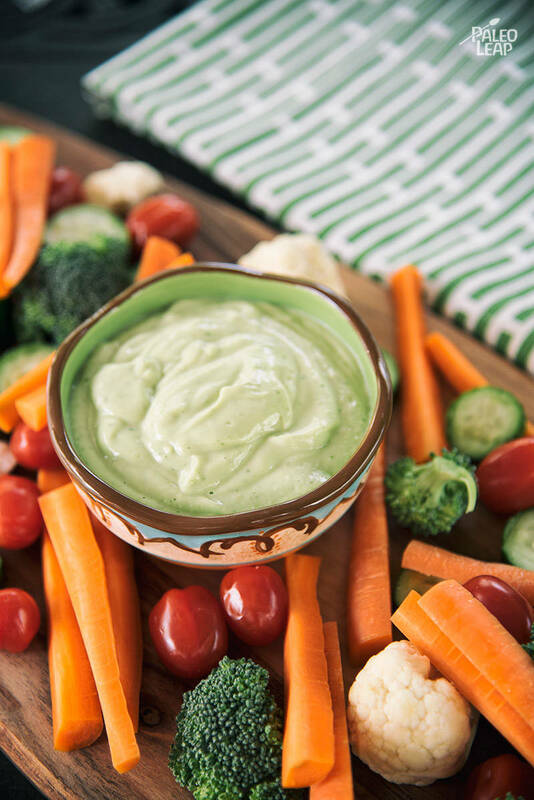 This avocado vegetable dip combines the creamy taste of avocado with the delicious tastes of homemade mayonnaise, coconut milk, and a variety of seasonings for an easy to put together and unique dip. The prep time for this dip is under 15 minutes, making it a perfect, last minute dish when something unexpected comes up. Depending on the mayo you use, this can also be a vegetarian-friendly dish! The key to saving time and making this dip quickly is to have homemade mayonnaise on hand before you get started. Traditional mayo found in grocery stores is often non-Paleo, so this is definitely something you’ll want to prepare in advance and store for future use. One of the greatest things about homemade mayo are all of the options you have for how you prepare it – this gives you the choice to keep it vegetarian-friendly if you’d like, or try a different version for some flavor variation. Regardless of the type of mayo you prep, just remember food safety – keep this stored in your refrigerator in a tightly sealed container for no longer than recommended. To serve this dish, pair your vegetable dip with an assortment of chopped vegetables – you’ll have a complete platter perfect for any guest! Place the coconut milk, mayonnaise, lemon juice, garlic, cilantro, hot pepper sauce, and season to taste in a blender. Pulse everything until you get a smooth sauce. Adjust the seasoning, and serve with fresh vegetables.